CEO Coach - Insights & Ideas Blog Don't let ordinary be your life or your business, IGNITE YOUR EXTRAORDINARY! As we head into the third month of the new year, I want to continue the conversation about improving your business performance by reducing employee turnover. As discussed in my recent LinkedIn article (read), focusing on improving retention of your best employees is a critical, strategic play to reduce turnover. There are many actions that you can take as a business owner or manager to improve turnover. For now, I want to focus on what I have experienced as having the greatest impact - cultivating talent. To begin, let's discuss the purposeful analogy of cultivating. Throughout my childhood, my father and his brother ​grew most of the vegetables that my family ate. My mother would have dinner ready when my father arrived home from work so that he could eat and then head to my Uncle's home where they farmed together. He worked most evenings until dusk, from early spring planting into the last of fall harvesting. It was work that took commitment and dedication, and it brought immense satisfaction with each delicious meal that we enjoyed. 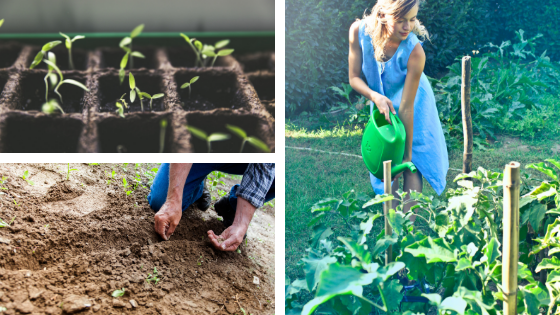 Whether planting by seed or seedlings, the same land preparation was required. The soil was tilled, often with nutrient material mixed into it during this process. Next planting furrows were lined into the soil before the planting could begin. Once the garden was planted in early spring, the work did not end; rather, regular tending and maintenance of the plants were required to ensure an abundant harvest. This included training beans onto poles, removing weeds that would rob the vegetables of important resources, pruning runners to increase production, treating pests, and so on. Why did my father and uncle give so much of their personal time to farming instead of buying vegetables at the grocery store, as so many others in our community did? As business owners and leaders, we are keenly aware of the costs and effort expended to recruit new employees; and yet, once those recruits walk through our doors, we step away and leave them to figure things out for themselves. This approach is akin to a farmer dropping seeds along the furrowed ground, walking away from the field, and returning in a month to find that many of the seeds have been stolen away by birds, others have rotted in overly damp soil, and less than 40% have begun to sprout. As with plants, each individual has specific needs and tolerance levels. If the fertilizer or light is too strong, the plant begins to brown and becomes less healthy. Similarly, you must adjust to individual employee needs. Some need more specificity about their role or guidance in completing tasks, while others experience that same level of attention as micro-managing their work. Regardless of these nuances, all employees thrive when they receive regular and authentic appreciation for their work and experience feeling of success in their role and belonging in the company that they have joined. Let me conclude by stating the most important part of this analogy - The gardener must be present and have his/her hands in the soil regularly. As the owner or business leader, it is healthy for you to delegate tasks. Delegation, however, is not the same as abdication. Just as with my father and uncle, economics, quality and value are important outcomes in business. Whenever you know that you can save money and get better quality, you have the start of a powerful value proposition. If you have a small company where you know every employee by name, get directly involved with the steps outlined above. If your organization has many layers of management, lead the charge in establishing the systems, processes, and culture that reinforce cultivation of talent throughout the company. Consultants specializing in organization development, such as me, are great partners in assisting with the design and implementation of these. 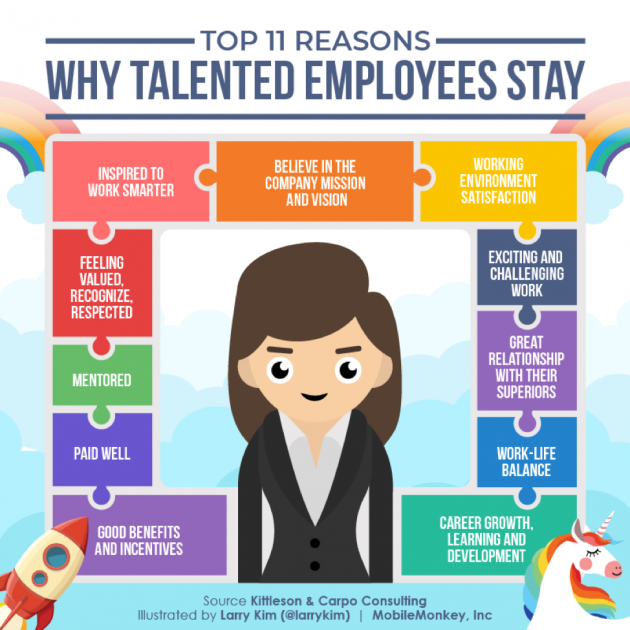 If you are ready to make talent cultivation part of your employee retention strategy, let's connect! PS - My special discounts for coaching and consulting work expire at the end of this month, so don't delay. In celebration of Valentine's day this week, I am writing about my appreciation of a dear friend, colleague, mentor, and coach, Geri. Whose peer coaching and mentoring have you valued over the years? Join me and express your appreciation this Valentine's Day to the colleagues in your life that have aided you on your journey to becoming your best self. My appreciation and respect for Geri is the result of deep and powerful conversations I had with her during one of the toughest years of my career. What is the real stand-out here, and this is really about who Geri is as a person, is that she showed up for me with support, coaching, and tough love when needed, and she and I had only been working together for a few months. On paper we were peers, but in reality, she had more wisdom and experience than I had accumulated at that stage of my career. From the very beginning, however, what made her stand apart from all my other peers was how she showed up in every conversation. Geri made curiosity the center of all communication. She was not judgmental or engaged in one-upsmanship parrying in meetings. Rather she was truly interested in learning about the thoughts and perspectives of others around her. She didn't seem concerned about being right or being the smartest. When you engaged in dialogue with Geri, her focus was only about supporting the best conversation and creating something mutually beneficial. I think that it was this characteristic that made it easy for me to show my vulnerability and ask for her coaching to help me build new skills at showing up differently in my conversations and interactions with those I sought to influence. Six weeks into the new year is a pivotal time for most of us in assessing where we are with the goals and energy we felt at the New Year.​ Setting goals or making resolutions is automatically an act of vulnerability because we are committing ourselves to do something that is beyond our comfort zone. Sharing that vulnerability with others can feel scary, but it also can generate a different accountability partnership that can spur greater success. When you tell someone with whom you regularly interact what you are trying to achieve and the specific actions that you are committed to doing toward that goal, you can then invite that person to help you notice when you are on path, when you achieve victories (big or small), and when you have slipped into old behavior patterns that you are trying to change. There is no doubt that we are conditioned to respond to rewards, and yet we often fall into the all or nothing trap, instead of noticing and celebrating the smaller steps forward that can string together into a much bigger outcome with consistency. That's where a peer coach is helpful. Let me clarify this idea by sharing more about my experience with Geri. Early in my career, I was in an expert consultant role. My job was to go into a business situation, assess, and tell the business leader what s/he needed to do. In my new role, I was being asked to shift from expert to coach. This required developing and refining a different set of skills such as listening, asking generative questions that expanded and deepened conversations, noticing what was not being said, etc. These skills are in some ways antithetical to the expert consulting approach because they are much more tentative and focused on opening and broadening rather than narrowing and deciding - a more natural fit to my ENTJ personality. I invited Geri to observe me in staff meetings and client meetings to help me notice what was effective, when I made choices consistent with practicing my coaching skills, and missed opportunities to use those skills. The added benefit that I didn't anticipate at the time was the impact this had in facilitating my whole peer group and manager noticing me showing up differently. This resulted in changes in assumptions and beliefs about what work I was capable of doing and how well I was performing. My growth during that time in my career was monumental because it fundamentally transformed my perspective, beliefs, and approach as a professional. I am certain that my ability to learn those skills and make them such a natural part of what I do would not have happened without the gift that Geri gave to me in agreeing to be my peer coach. We have all heard that the greatest rewards often come when we take the greatest risks. Choosing to share your goals for self-improvement with others and inviting them to become part of your feedback and reinforcement system may feel like you are taking a risk. I believe, however, that this is the accelerated path to transformative change. Double down on your goals - ask a friend to be your coach or accountability partner and Ignite Your EXTRAORDINARY! In the first article of this series, we pulled back the curtains and looked at all the ways that turnover costs you money. In Part 2 we examined the revolving door of new hires with two key approaches, using more effective selection techniques and learning more about why people are leaving. If you followed my coaching (and ignored that pesky voice in your head that was telling you, "Who cares why s/he resigned, s/he wasn't a good fit anyway") and chose to get curious and ask questions, use that information to work on what creates long-lasting, sustainable elimination of turnover costs - Retaining your BEST employees! but launched a management philosophy too. So what am I suggesting that you learn from this? Be clear and bold about your why with the intent of creating direct connections for all positions and people in your company. Believe in the talent that you have and invest in helping them achieve skills, learning, and job advancement to allow them to shine and continuously contribute fully to your mission. Eliminate systemic dissatisfaction which is caused by issues such as lack of job clarity, unrealistic workloads, communication barriers, insufficient pay/benefits, etc. Foster ownership at every level. There's lots of research and information available regarding why employees stay in jobs such as what is provided in the infographic below. These ideas are accurate but provide incomplete understanding and answers. Many business owners make the mistake of increasing employee benefits or paying for professional training in an effort to "be more competitive" in the battle for talent, only to find that they are spending more money and still struggling with the same problem. The reason is that these are not discrete items to be selected from a buffet of ideas. Rather, there is a complex interconnection among these ideas that must be understood and considered to create comprehensive and sustained improvement. what do I know is happening or not happening that creates employee dissatisfaction and resentment? what additional information do I need to collect? what do I know about my best employees and what matters to them? how am I engaging with them in a mutually beneficial way to maximize their contribution and fulfillment as an employee? if employees at every level operated with high levels of ownership, what would they be doing/not doing? how am I contributing to or getting in the way to that ownership? In the first article of this series, we pulled back the curtains and looked at all the ways that turnover costs you money. We used the analogy of suffering a severed femoral artery, and I promised you a comprehensive treatment plan to not just temporarily staunch the bleeding but to repair the damage with surgical accuracy and restore health to your staffing process. ​So let's begin with the most important step - the tourniquet. The purpose of a tourniquet is to slow the immediate and rapid loss of blood temporarily. In the context of business hiring, this is the new hire revolving door - people leave as quickly as new people are hired. Staggering when you add this 30% number to the cost calculation we covered in Part 1, right! Now add the additional multipliers of the currently low unemployment rate and the impact of employer review sites like Glassdoor where disappointed and grievous employees freely share their cautionary tales with other job seekers, and you can find yourself with a significant deficit in even attracting the caliber of talent you need. We are wired to protect our self-esteem and rejection (even in the form of quitting your company) is definitely perceived as a direct attack. Thus our minds will generate an internal dialogue in which we dismiss and diminish the person who leaves making anything they may have to say as irrelevant before it is even heard. We like to be right; in fact, neurologically we are programmed to select data that reinforces our "right" thinking and ignore conflicting data. Ipso facto, the reason for departure is not about us but is a problem with them. Don't fall victim to your instincts to protect and preserve - they are wrong! It is time to get curious and learn what is happening. Don't limit your questions to the people who leave. Broaden your scope to include others who were close observers and can share their direct insights into what happened. It can also be helpful to contrast this data with data about the people who were recently hired and stayed. You can't accurately target solutions if you don't have an accurate understanding of the problem you need to solve. What knowledge and skills can I tap into to create a target selection approach to my positions with the greatest turnover? Who else on my team would be a great contributor to this effort? How much time can I afford to give to this issue while avoiding the detrimental diversion of my time from other important needs and issues? Thanks for reading! Please leave your comments and questions below and check back for Part 3 of this series where we will explore how to improve the retention of seasoned employees. Most employers intuitively know that employee turnover is costing them money, although few know how or have attempted to quantify the cost. I came across this infographic that does an excellent job of summarizing the costs that are easiest to quantify. And yet, there is one additional cost that is huge for most businesses - the cost of stress, overwork, and dissatisfaction experienced by the remaining employees when someone leaves. How many added tasks are assigned to me? How long will I have these added responsibilities? How much of my time will be required to teach the new person how to do their job? How much extra time at work is required in order to complete everything? How much of my life outside of work is disrupted by these added responsibilities? Am I being paid enough for all this added work and hassle? Is it time for me to start looking for a job somewhere else? The smaller your business, the more difficult it can be to navigate turnover without creating dissatisfaction. Even if you take on much of the work as the owner, it means that you are distracted from your core responsibilities which can make you less effective in important tasks like communicating clearly with customers, employees and vendors and providing clear direction to your remaining staff. Fixing critical business issues such as staunching the loss caused by serial turnover, requires a commitment to multiple actions. A great analogy is to think of serial turnover as a severed femoral artery. Although the first step is to place a tourniquet above the wound to prevent immediate death from bleeding out, this treatment alone is insufficient to sustain life. A patient with a severed artery must receive surgical treatment to repair the artery, followed by treatment of the wound to avoid infection and aid repair of the surrounding tissue. In this multi-part series, I will share with you my insights about how to craft your comprehensive treatment plan. 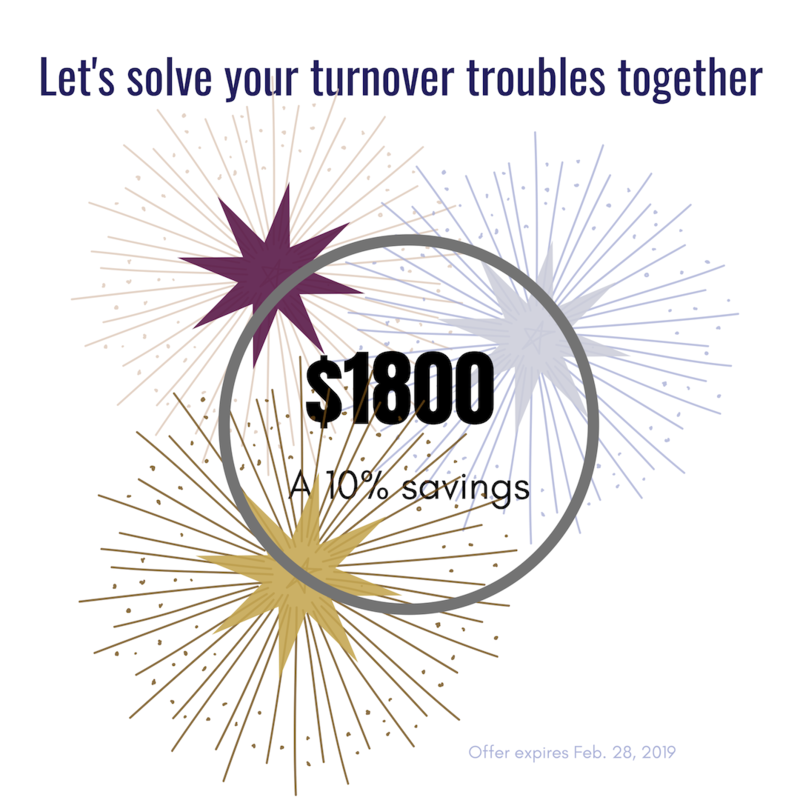 We will explore the causes of serial turnover, ways to eliminate it, and how to think differently about managing your business during staff vacancies. In my experience, the answers are not complex, but do require focused effort. Most importantly, you will learn why there are no short cuts or magic bullets and why actions such as improving selection tools and processes are only tourniquets and therefore insufficient to restore health to your business. Why do people apply for a job with my business? What method(s) do I use to source job applicants? What decision criteria do I use to select employees? ​Check back in a couple of days for the next part in this series. Feel free to post comments or questions below or contact me directly if you would like to have a personalized conversation to jump start your EXTRAORDINARY year. Copyright©​ 2018 by Rita Ernst. All rights reserved.